The Stitcher's Keeper is a great way to keep your sewing supplies together. 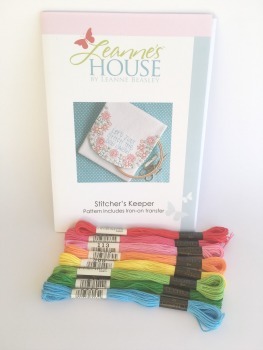 This kit comes with the lovely stitchery pattern from Leannes' House, white hanky linen for the outside of the keeper and a set of Cosmo high quality, silky threads in 8 beautiful colours. Please note the lining fabric (Leanne used a blue/white spot) and thin iron-on batting are not included in the kit. The Leanne's House pattern includes an iron-on transfer as well as a traceable design if you prefer. Hanky linen is 55% linen and 45% cotton.